Coming this week I'll be teaching at The Great Bead Escape in Orlando, FL! My classes are Byzantine weave, Olivia weave and Japanese 4 in 1 earrings. Check it out! There still may be time to register. There are many other wonderful teachers and classes including wire wrap, beading and silversmithing. Now to get into the present year! The Florida Jewelry Artist Retreat Group started out the year in fine form! We had our 3 day 4 night retreat in Everglade City! Suzie arranged for us to all gather at Everglades Isle Resort! What a great time we all had. I taught European Lace chainmaille and Going Round in Circles beading project! The Naples Princess took us on a boat tour of all the fabulous homes in the Naples/Marco Island area! California saw me again in March! I had, again, a wonderful time! This time the timing was right to see Will in some baseball games. He's getting to be quite a good player and Bill is a great manager.......he's so patient with the kids! I also designed a new piece using twin beads. It is simply a brick stitch pattern around a round crystal and still using the brick stitch I bridged the two holes with 3 size 15 seed beads! Easy! Happy Mother's Day to all you mothers out there! I'm spending the day with my daughter, Mary and her family! Oh, so much time has passed since I last blogged! A whole year! I don't expect to catch up but here goes! 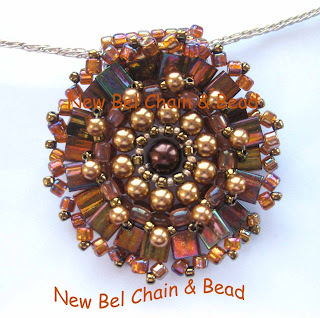 I taught many, many classes in 2011 at Beads and Baubles in Fort Pierce, FL and those continue on! I attended and taught at 4 retreats last year. Two in NC and two in FL. I also had some very nice get togethers with my beady friends in SC. I made a trip to CA to see my son and his family in August (in time for Will's birthday) and I repeated that in March of 2012 in time for Bill's birthday! I designed La Mesa Sunset with Tila beads while sitting looking at the magnificent sunset from my son's windows! I did a lot of traveling between South Carolina, North Carolina and Florida! California gave me a different coast altogether! I never get tired of seeing both the Atlantic Ocean and the Pacific Ocean one day after the other! I make a point of doing that! I spent Thanksgiving and Christmas with Mary and Oliver which is always a wonderful thing! My son Nick moved from NY to Denver. I brings him a little further away but gives me a new place to visit and he seems to be quite happy with the move!